...Online For Our CSL Events! Led by our faith, BCI leads by example. Our fourth season of BCI Courtside Live began on Tuesday, October 25. In the first of four events this season, Clark Kellogg moderated a chat with players John Bryant (Player Development Coach-76ers), Mike Penberthy (2001 LA Lakers Championship Team) and Garrett Temple (Sacramento Kings). Check out a brief highlight from the event. Over 15,000 have tuned in to our series of real-time, interactive public (free) events that connect pro basketball players to kids and fans around the world. There's no script, so the conversations are totally authentic. Players speak from the heart for a unique experience that can be shared by everyone, everywhere. Our next event is scheduled for Monday, February 13, from 9:00 - 10:00 pm ET, just prior to the NBA All-Star Weekend. Replay archived CSL events here and be sure to share the experience! We believe that a moment can change the trajectory of a child's life. And we believe pro basketball players can create those moments. BCI was founded to support professional basketball players - men who are willing to hold themselves and each other accountable for their choices so that, together, they may influence the next generation in a positive way. Through the generosity of one of our donors, all donations made to BCI on GivingTuesday, November 29, will be matched dollar for dollar up to $15,000. Gifts to BCI in any denomination are greatly appreciated and will go towards BCI's outreach initiatives for kids to help create more life-changing moments. Add your voice to ours on Tuesday, November 29 here. 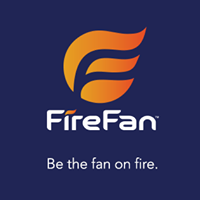 I would like to personally invite you into the world of FireFan. The hottest interactive Sports App community ever created. Pre-register here with our access code Sharm46 and be among the first to receive the app launching in November. Be sure and watch the trailer on the pre-registration page. ...all in real time while you are watching the Game! You get a chance to compete against your favorite sports heroes, celebs, your college buds, friends and family. Anyone, any age, any level can play - for FREE! Don't just watch. Join us and be a part of the action. BCI keeps in touch with our supporters, volunteers and fans through social media like Facebook and Twitter. We welcome your support and we hope you will join us online and help to spread the word about BCI! Please feel free to forward this email as well.